Finding a garden furniture set for your backyard is easy. But what should you look for if you want to find the best? Practicality is important to make your garden into a functional space. The quality of the materials affects the durability of the set. And there are many other features to consider. To help you decide, our expert team has identified, tested, and rated the most popular rattan garden furniture sets on the market. See our top picks below. All of our reviews are completely impartial and we receive no products or monetary compensation from any of the brands we review. As you might expect, we make money to help run the site through banner advertising and affiliate commissions. A high-quality modular system garden furniture set – easy to arrange for an optimal space efficiency. Easy construction. A stylish and inexpensive rattan furniture set for the budget-conscious homeowner. Comes with a 5 year warranty. A stylish sun lounger / day bed that comes as a four piece set. Has enough components to accommodate up to 8 people. A corner sofa set with five to nine pieces that can mix-and-matched. Highly durable and available in a multitude of colours. Rectangular corner sofa that works well in square spaces. Completely customisable and comes with accompanying table. Four piece set that also accommodates up to four people. A glass-covered table included which is easy to clean. Outsunny 5-Piece sofa and coffee table set is our favourite rattan furniture on the market because of its versatility, conferred by the modular design. This set comprises a sofa, composed of a middle seat and two corner seats, a stool, and a coffee table. The stool and sofa join together stylishly, or offer separate seating solutions – depending on your space and requirements. The coffee table completes the design and is covered by a smooth glass tabletop that protects the polyethylene rattan surface and provides a sturdy support for food and beverages. Both stool and sofa come with extra-comfy cushions filled with 8cm thick cotton and covered in water-resistant and machine washable polyester cloth. We also like the sturdy and rust-resistant galvanised metal frame of the seating and table. The polyethylene rattan wicker is all weather-resistant – withstanding all elements including sun, rain and snow. Both the seats and the table have a fantastic weight capacity. Each seat can bear up to 160kg while the coffee table withstands weights of up to 70kg. Although minimal assembly is required, the parts join together perfectly. The set is also easy to dismantle and it folds flat for easy storage and transport. The modular system is easy to rearrange for an optimal space efficiency. The set is also easy to assemble and dismantle. Extra-deep modern low-seating sofa and stool with thick back-support cushions create an amazing garden design. Rust-resistant galvanised metal frame and durable, weather-resistant polyethylene rattan wicker withstands years of usage. Zippered cushion covers are easy to remove and wash. 8cm thick cotton filling provides optimal comfort. Levelling feet allows a quick and easy adjustment of the furniture on uneven floors. This set comes in three colours and styles and is easy to integrate into any garden design. The assembly instructions are not accurate; however, it’s easy to put the pieces together. Allibert’s Rosario is an affordable balcony or garden furniture set easy to integrate into all environments, from conservatories and entertaining spaces to patios and terraces. Made in Europe and guaranteed by a 5-year manufacturer’s warranty, the product is TUV and ISO 9001 certified, which means it complies with all European Union regulations. 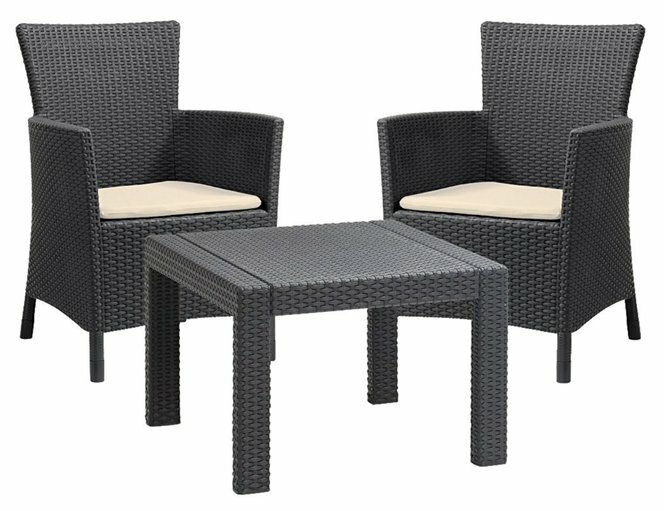 This high-quality set is made of durable all-weather proof and UV-resistant resin and boasts an elegant wicker design finish. With its sleek and sophisticated style, this table and chairs set is easy to integrate into any garden, while the resin is easy to clean and requires low maintenance. Built for comfort, Rosario’s chairs also have an ergonomic design with a high backrest, sturdy armrests, and 4cm thick fire-retardant cushions. Moreover, the table is roomy enough to hold all things needed to relax in the garden. The manufacturer, Allibert Outdoors is a member of the Keter group, a brand renowned for their high-quality resin outdoor furniture and storage solutions. If we were to identify any drawbacks of this product, it would probably be the rather tricky assembly – which can be a pain! 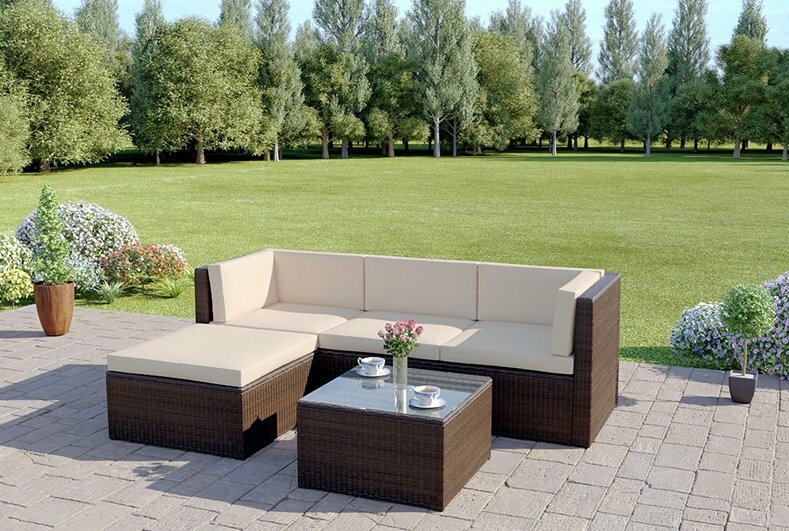 Graphite resin with cream cushions integrates perfectly in almost all garden designs. The furniture boasts sleek and sophisticated lines. Ergonomic chairs have a high backrest and full armrests. Each chair measures 62x60x89cm while the table measures 59x59x43cm. The rattan-style resin material is durable, tough, and easy to clean with a damp cloth or with a sponge and a garden hose. Economical product made in Europe and backed up by a 5-year manufacturer’s warranty. Allibert Rosario is made of durable UV-resistant resin that withstands all weathers and elements. Assembling the product doesn’t require additional tools, but the parts are tricky to fit together. Four-centimetre-thick cushions don’t provide the advertised comfort. Thanks to the standard size of the chairs though, they are easy to replace if needed. This sun lounger day bed by Clifford James is an amazing rattan garden furniture set composed of four pieces and spacious enough to accommodate up to eight people. The set comprises a comfortable sofa with retractable canopy, two lounge stools, and a central table. The modular design allows pieces to fit together to make a large and cosy day bed while the extended canopy provides perfect shade on hotter days. What we liked best is the product’s design. This set is elegant. It boasts a unique luxury flair that makes it a functional focal point able to improve the curb appeal of a property. Coming with a full set of bottom cushions and four scatter cushions, the product is comfortable regardless of its arrangement. 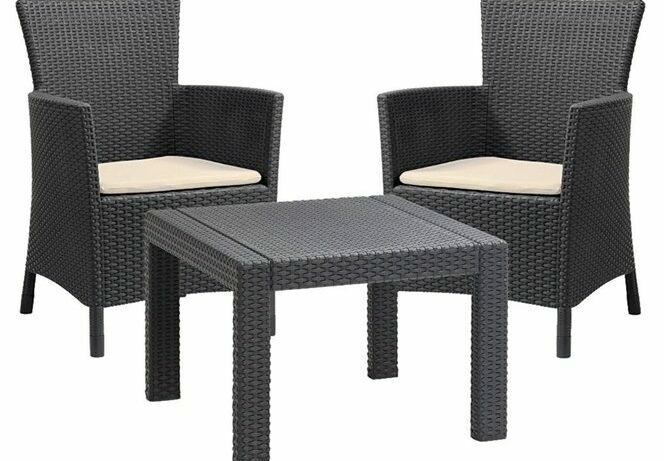 This stylish lounge set is made of rattan-effect polyethylene and comes in three colours. Grey with cream cushions is an elegant mix that matches with most outdoor areas, but the manufacturer also proposes a black version with cream cushions or brown with cream cushions. A spare cushion set, a spare canopy and a green day bed cover are also available from the manufacturer and add to the product’s convenience. Unique and functional focal point set comprises a stylish sofa, two lounge stools and a central table that fit together in a luxurious day bed. 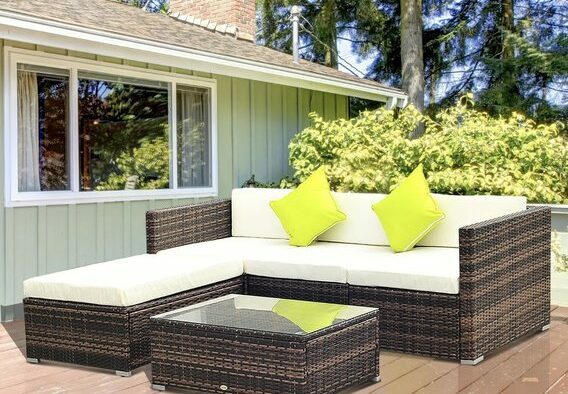 Elegant rattan-effect polyethylene provides long-lasting durability and comes in three attractive colours. Removable foam-filled cushions with a polyester cover are comfortable and easy to clean. A spare cushion set is sold separately. Roomy set with seating for up to eight people. As a whole, the day bed measures 183x183x148cm, including extended canopy. As separate pieces, the sofa measures 45x183x148cm with extended canopy, each stool measures 45x106x31cm, and the central table measures 56×30.5cm. Furniture is easy to wipe clean with a damp cloth or wash with a sponge and a garden hose. Assembly is a hassle; the pieces are hard to fit together and the instructions are not always helpful. Although it looks amazing, the day bed feels a little flimsy. Abreo proposes a versatile rattan modular corner sofa set comprised of five pieces that mix and match with multiple optional pieces to make for stylish garden furniture. Ideal for outdoor and indoor use, the set adds value to a conservatory or patio, to an open-air lounge area, a terrace or a garden. The set comprises two corners and one middle sofa seat, an elegant ottoman and a coffee table. Showerproof cushions with convenient zip fastening cover all seats and are easy to clean if required. Moreover, elegant safety tempered glass on the table provides the perfect surface for food and beverages. One fantastic feature of this product is its durability. 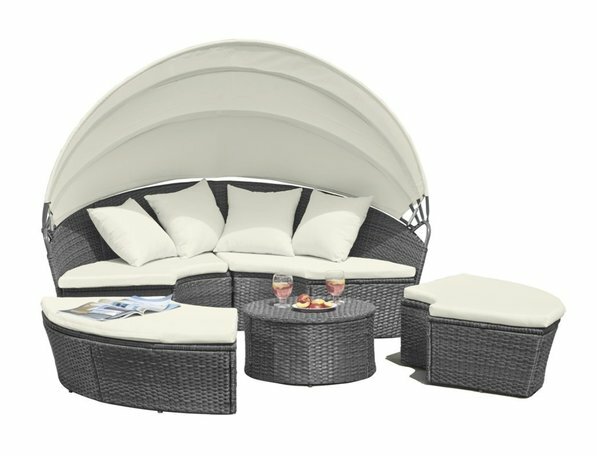 The set is made of rattan-style and UV-protected polyethylene material designed to withstand all weathers while a convenient cover provides further protection from elements. Another awesome characteristic is the modular design that adds versatility. The set is easy to arrange in several stylish solutions that adapt to most spaces and needs. Out of the box, the product has a four-seat capacity, which is easy to increase with the additional ottomans and middle sofa seats sold separately. But the choices don’t end there. The set is available in seven colours and styles that adapt to different environments. Modular design allows many arrangements of the Corner Sofa Set. This rattan furniture is adaptable and versatile. Spacious seating accommodates up to four people. Each corner seat measures 70x70x68cm, the middle seat measures 62x70x68cm, while the ottoman measures 70x70x35cm. The size of the coffee table is 60x60x35cm. Rattan-style polyethylene material is all weather resistant and suitable for both indoor and outdoor use. 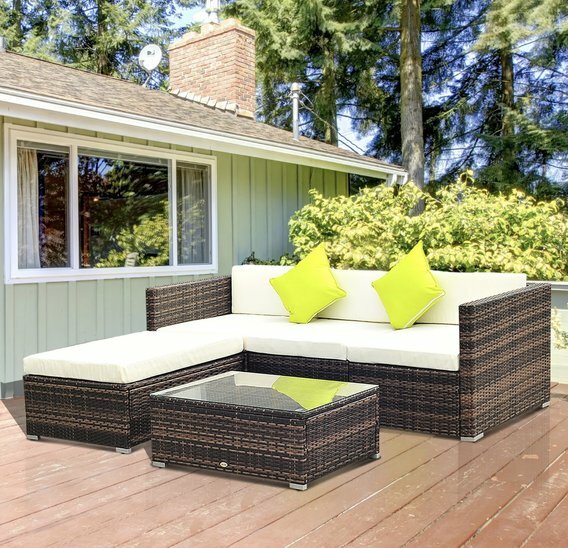 This set can complement a conservatory or an open-air space. Dirt-resistant material is easy to wipe clean with a damp cloth. Cushion covers are also easy to remove and wash if required. Additional modules increase the seating capacity and the versatility of this product. Convenient cover protects the units from rain, dirt, grime, snow, frost, and other elements. Assembly parts might have manufacturing and align Fitting the components is a hassle. Cushions are thin, lightweight and not very comfortable. A heavier and thicker padding would have been ideal. The accompanying cover is poorly made, very thin and easy to tear apart. Another elegant rattan furniture set that impressed us is the Life Carver Garden Couch Corner Sofa set. This versatile product boasts a modular design and comprises two corner seats, four single seats and a convenient coffee table. Each seat measures 67x67x66 cm while the dimensions of the table are 67x67x34cm. The seats come with machine washable soft bottom and rear cushions while the table is also covered by an easy-to-clean glass tabletop. We like the soft brown colour that matches wonderfully with the cream cushions and blends in almost all landscapes. 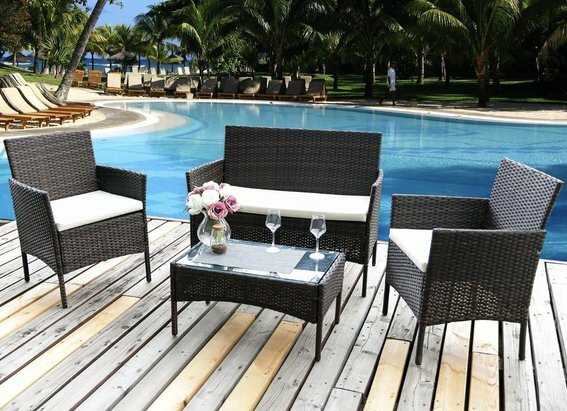 The hand-woven polyethylene rattan-style material is durable and water-resistant. But although it withstands adverse weather and the elements, it is recommended to protect it from intense sunlight. The multiple arrangement combinations are also easy to adjust according to your space or personal preference. A slight drawback of the product is the rather flimsy material it’s made from. Moreover, the product doesn’t have good stability on all surfaces. Despite this, the set is stylish when assembled, it integrates well with most landscapes and is spacious enough to accommodate up to six people. 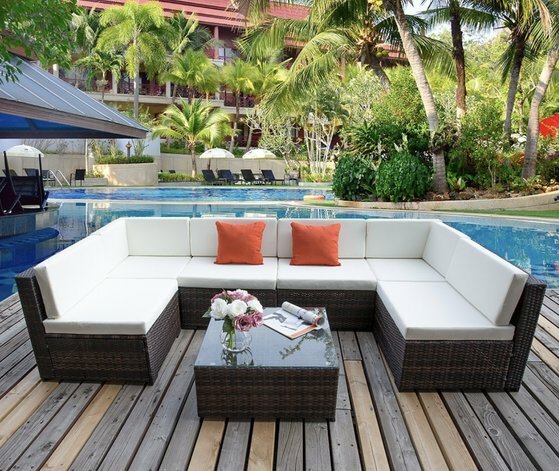 Hand-woven brown polyethylene rattan is durable and water resistant. The colour looks great in most outdoor spaces. Cleaning the furniture is easy. The rattan material and glass tabletop are easy to wipe clean with a damp cloth, while the cosy cushions are machine washable. Constructed in three separate pieces, the sofa is easy to customise and arrange based on your preference or space. Furniture slides on some surfaces, such as composite decking. Sadly, there is no way to interlock the seats without damaging the material. It takes time to assemble the product, and the parts are not always aligned properly. The product is shipped in three different packages which may or may not arrive together. This isn’t a real drawback, but it’s annoying. Of all rattan garden furniture sets, this 4 Seater set by Life Caver caught our attention because of its affordability. This inexpensive product is made of durable and water-resistant polyethylene rattan and comes in two shades of brown. With a sleek and stylish design, the set blends easily in all landscapes. It comprises a comfortable double sofa, two armchairs and an elegant coffee table with easy-to-clean glass tabletop. The high backrest of the sofa and seats ensure an ergonomic design while the accompanying bottom cushions improve comfort levels during use. Seating is roomy and can accommodate up to four people. The sofa measures 93x48x81cm, each armchair measures 48x48x81cm and the coffee table measures 70x41x37cm. Another great feature of this set is the ease of cleaning. The cushions are machine washable, while the furniture is easy to wipe clean with a damp cloth. The only thing we’d have changed is the thickness of the cushions, which are only 5cm thick. Brown shades blend well in all landscapes and make the set suitable to use in all outdoor settings. Showerproof finish and fully weather-proof polyethylene rattan allows for storage of the set outdoors, all year round. Flat weave rattan boasts an extra-smooth finish. Ergonomic design with high backrests and full armrests increase comfort. Furniture and cushions are easy to clean. This set needs minimal maintenance. Assembly is a hassle. Aligning the parts together is time-consuming and frustrating. Thin cushions are lightweight and easily blown away by the wind.